Greetings, and welcome to the All-Purpose Crash Bandicoot Topic! Crash Bandicoot is a series revolving around an orange marsupial called Crash Bandicoot and his arch-nemesis, Dr. Neo Cortex. Crash, with the help of friends and family, like his sister Coco, his sentient mask friend Aku Aku and his semi-brother Crunch, set into adventures on the fictional Wumpa Islands in Australia in order to stop the evil plans of Cortex, his henchmen, and other enemies. The main series consists mostly of 3D platforming games, with focus on linear level design and extra tasks like breaking crates or collecting Crystals and Gems. The series has gone trough many styles of gameplay, both for its spin-offs and for some of the more experimental main entries, with the franchise trying out on kart racing games, 2D platformers, party games and even beat 'em ups. This is due to the many studios and publishers who got hold of the franchise as time went on, but the series is now owned by Activision, with current games being made by Vicarious visions, Toys for Bob and Beenox. Crash Team Racing: Nitro-Fueled is the next game in the Crash Bandicoot franchise. It is a remake of Crash Team Racing for the original PlayStation, and it includes the entire original game - from Adventure Mode and Cup Mode to Battle Mode and Time Trials - with fully remade visuals, plus additions like online multiplayer, new vehicles, vehicle switching and "more to be announced". The game will be released on June 21, 2019 for the PlayStation 4, XBox One and Nintendo Switch for a price tag of $39.99. A special edition called Nitros Oxide Edition, available at $49.99, will include Nitros Oxide, the main antagonist, and his vehicle from the get-go, plus space-themed skins for Crash, Coco and Cortex, and "more to be announced". Players who get the standard version can unlock Nitros Oxide and his vehicle during Adventure Mode. 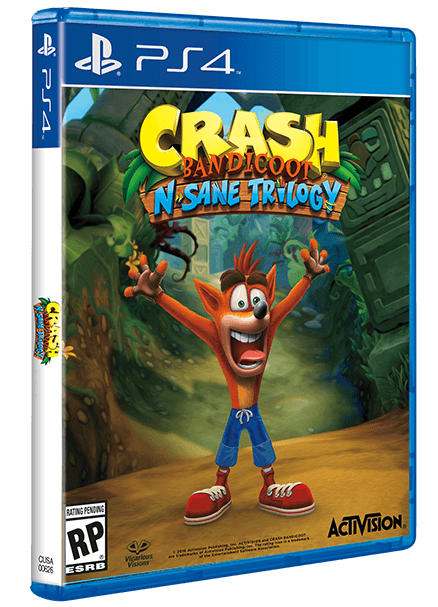 Crash Bandicoot: N. Sane Trilogy is the latest game in the Crash Bandicoot series. It is a remake of the first three Crash games for the original PlayStation, including Crash Bandicoot, Crash Bandicoot 2: Cortex Strikes Back and Crash Bandicoot: Warped. The games are the same as before, but with visuals and music remade from the ground up, plus a lot of tweaks and new features, like Time Trials in all three games, a playable appearance from Coco in all games, a crate counter in all of the games, and more. The game is available for PlayStation 4, XBox One, Nintendo Switch and PC (by the Steam store). 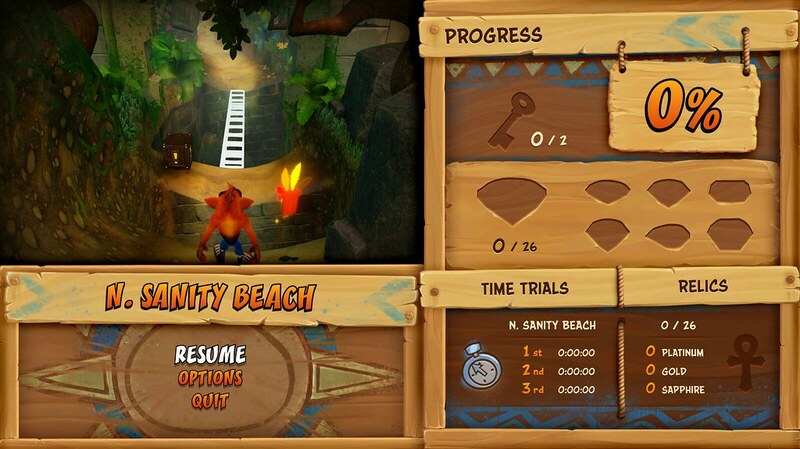 Two new stages can also be downloaded for free, called Stormy Ascent (a cut level from the original Crash Bandicoot) and Future Tense (an all-new level for Crash Bandicoot: Warped). Guess there was no lie when they said they'd use Imaginators as framework for the assets - you see the same plants and statues, and it feels a lot like VV's Skylanders engine. Knowing VV, doubt they could screw this up even if they tried, and it looks pretty good as is(though a bit snappy on the movement, probably so it doesn't break the original level design). I just hope it's not at the expense of their other franchise. From the looks of it, they might add a bit more narrative to the first game since it lacked a story besides the premise. I heard some people complaining about Crash's design and slowdowns made for the trailer (they think it's something in the game) because why not. It might be altered, but it feels a lot like the in-engine cutscenes from SC. OHHHHHH! This looks super sweet! I really regret getting an Xbox One now... CHRISTMAS 2017 IT IS! No doubt they're using the modern Skylanders engine. Looking at the gamneplay and seeing the sky, those are pretty much Skylands clouds. Still looks to be very WIP from what I can see. That said, it really does seem to be a faithful recreation... at least for the original. Tawna's there and everything. Oh i didn't know about this. Looks like nothing much has changed except the graphics. Good and bad in my opinion. But i'll pick them up no doubt if they come out on opportune times. I´m surprised to see Tawna, I know that she´s a character from first game but she only appears in the first game and another game for the DS... Totally looking forward to the remakes. Well, they are remaking the first game, after all. If she was in that game, why wouldn't she be in the remake? It was not even parents, it was Universal itself. Looks neat but not too appealing at the same time. The levels look pretty snazzy. I wasn't that hyped when they announced it before but now I'm intrigued. We're ONE step closer for Spyro's return to glory! Let get through these years! God, does this look beautiful. I love how they actually kept it as close as they could to the original, it really makes me happy. The scenes look really nicely animated too! I mean from what VV did in Imaginators which I assume is their understanding of the character, Crash *can* talk, he just doesn't 99% of the time. He still says some full words every now and then. But the point of his character is that the experiments done on him by Neo ****ed his brain up and left him with below average IQ, which was a large appeal of the character and was endearing that this idiot kept saving the world. That I get. His role in Skylanders Academy isn't canon anyway and was the result of bad timing to begin with. But he can say stuff, still, he's not exactly silent protagonist. Also, is this really a press-avaliable demo like Bloodstained? The short footage all made it seem like it's just short sections, but that stream shows it's a full-on demo of 2 levels. It depends on the game. He's totally silent in TwinSanity but makes so much noises in Titans/Mind Over Mutant that it almost feels like gibberish. On the original games, he makes simple noises and words like "oh no" and "tah-daaah". Thanks for sharing this. So I can assume you can die and still get the Crate Gem? Huuuuh. i had to stop watching cuz he was so bad, how can you be that bad? "Okay guys now you gotta be really careful at this spot and make sure you dont fall cuz it's a really hard jump"
Holy **** I'm so excited!!! The URL says "standard-boxart-ps4". Special edition incoming? I dunno, you could also argue the "ps4" part of that URL is pointless. Wow I hope to Eon this game is gonna be good. That player I'm sorry, but he was horrible. seeing the trailer made me sad. my grandfather, who died of a heart attack in 2007, was a really huge fan of crash. i'd watch him play it when i went over to my grandparents. i bet he would've loved this. Well those are legitimate complaints though. Personally I think Thumpin' Wumpa Islands nailed what I wat from Crash and feel it was a wasted opportunity not to use that artstyle, and even if they didn't go with it (because I'm sure people would sill complain about that) they could do much better. The graphics have grown on me since I first saw them, but part of me still REALLY hopes they're WIP, because... Sorry for saying it like this... I can't shake the feeling that this artstyle comes across a bit as UE4 fan remake-ish. More importantly, from what I've seen, the response to today's footage doesn't seem like it's a load of nonconstructive whining. Am I looking on the wrong places to see the whining? lmao. Seriously, I lurked GameFAQs and some video comments and even looked at a video which had a negative response to the remasters, but I haven't been seeing "childhood ruined" or "what the **** is this ****". People keep complaining about the voice and music despite being the same as before on some general game subreddits. Oh. Reddit. That explains everything. I kinda agree that the sound effects don't quite feel the same, but it's not like the graphics where they feel sorta out-of-place to me, even if I kinda notice they're different (mainly the extra life sound effect, it's kinda underwhelming compared to the original, imo- and yes I know that's nitpicky, but we barely have any footage and I have a lot of hype, so if you want I can start pointing out stuff that's technically nitpicks that I like/think is good). Which I personally consider as their best voices. Not the cutscene voices, people are saying Crash's SFX is different. Maybe the pitch changed a bit, but it's the same there. OMG I'm so sorry to hear that and I give you my condolences to your grandfather . I too bet he would have loved these and I hope you love this game as much as I hope to enjoy it. only disappoint faun has with this is it being ps4 only. console exclusives are bad for business. maybe keep hope for wii u version. really have hope for spyro trilogy remake. Bad for business? I mean, the point of exclusives is to make people want to buy a specific console. The entire gaming business for console manufacturers is to get as much exclusives as possible. 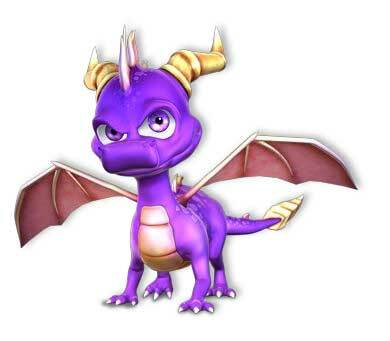 That said, I also hope Spyro gets something along these lines. that has not been true since the 90s. if it were true, there would be more exclusives today, not less. there are much less exclusives now. nobody buys a console for one game. That's why companies won't stop at one exclusive. They try to make as much as possible to attract people to their consoles.